Paramilitary intervention in this zone was carried out by the Autodefensas Campesinas de Córdoba y Urabá (ACCU). In addition to acts of terror against the rural society, they violently attacked the artisanal miners resistance which was organized through different local committees linked to the Federación Agrominera del Sur de Bolívar – Fedeagromisbol. In addition to these tragedies there were also massacres and incursions perpetrated against the different municipalities and veredas. The Bloque Central Bolívar was the paramilitary structure in the South of Bolívar. It controlled the drug-trafficking in the region. This bloque was recognized as the biggest paramilitary structure in the country – by mid-2004 its forces were composed of 5.000 men – and it was present in 23 departments. The rural community was the main victim in this region. Hundreds were assassinated, tortured and/or disappeared, many were exiled and displaced. These acts were jointly perpetrated by members of the Army and paramilitaries who brought terror to the zone between 1995 and 2003. Among the military units that perpetrated crimes in the South of Bolívar, the No. 2 Nueva Granada of the Air Defense Artillery Battalion stands out but it was the Mobile Brigade No. 1 which was the main responsible for crimes against humanity committed with the paramilitaries between 1966 and 1998 in the region. In these crimes, the Héroes del Majagual Battalion also intervened. And more recently, these raids came from the Nariño Battalion and the Alta Montaña 46 – Manuel María Torices Battalion. The social movement in the South of Bolívar and the South of Cesar faced high levels of repression and systematic attacks. In 2008, the region faced the “false positives” phenomenon perpetrated by the 15th Brigade of the Army which was based in Ocaña : young people were recruited under promises of a good job and then were killed and presented as guerrilleros who died in battle. Since 2017, regional social organizations have reported the injustice, abuses and judicial persecution that social leaders have had to face. During the biggest operation instructed by the General Attorney Office, 12 members of social movements were captured for alleged connections with the Ejército de Liberación Nacional – ELN. The operation was ordered by the Attorney General María Bernarda Puentes López, who is the subject of an ongoing investigation into corruption for favouring paramilitaries in the department. The South of Bolívar chapter was created in June 2009 with a huge gathering of more than 500 victims in the city of Aguachica. It then converged with the Catatumbo region with the associations of displaced people from the Comité de Integración Social del Catatumbo. The chapter is composed of the Federación Agrominera del sur de Bolívar – Fedeagromisbol which gathers 45 associations of independent local miners, farmers and fishermen, and committees of victims from the municipalities of San Pablo, Simití, Santa Rosa, Morales, Rioviejo, Montecristo, Norosí and Tiquisio; the Comité de Víctimas de Aguachica, Gamarra and San Martín and Catatumbo; the Comité de Integración Social del Catatumbo (CISCA). 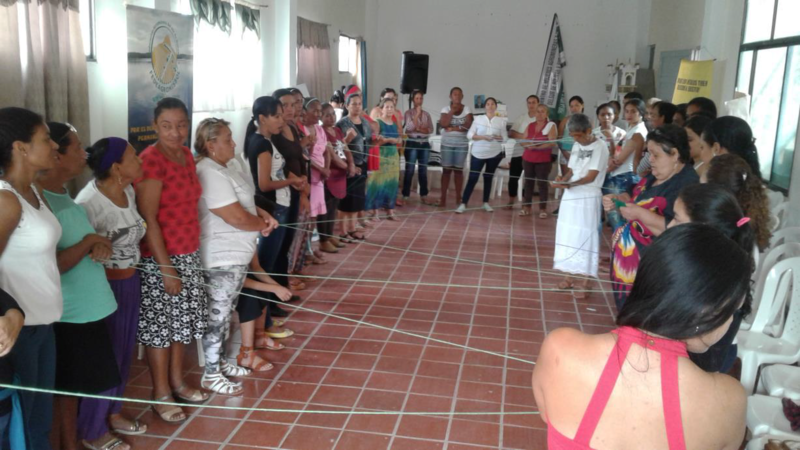 In the municipalities the committees are composed of victims and women associations and Juntas de Acción Comunal.